Set during the separation of Norway from Sweden in 1905, this richly detailed novel of love and loss was inspired by the life of the author's great-great-aunts. Oleanna and her sister Elisabeth are the last of their family working their farm deep in the western fjordland. A new century has begun, and the world outside is changing, but in the Sunnfjord their world is as small and secluded as the verdant banks of a high mountain lake. With their parents dead and their brothers all gone to America, the sisters have resigned themselves to a simple life tied to the land and to the ghosts of those who have departed. The arrival of Anders, a cotter living just across the farm's border, unsettles Oleanna's peaceful but isolated existence. Sharing a common bond of loneliness and grief, Anders stirs within her the wildness and wanderlust she has worked so hard to tame. When she is confronted with another crippling loss, Oleanna must decide once and for all how to face her past, claim her future, and find her place in a wide new world. 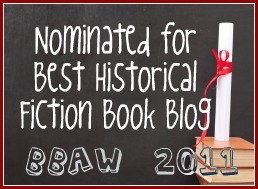 I am always curious about historical fiction novels set in countries that I am less familiar with. 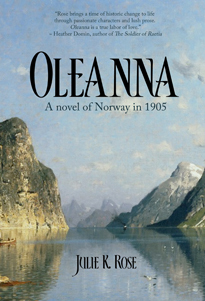 When I found out that Oleanna was set in Norway at the beginning of the last century I just couldn't resist it. Oleanna is the name of the main character - a woman nearing thirty who has seen most of her family members die and her older brother leave to America. She stayed behind with her sister Elizabeth and a younger brother but now he wants to leave too. The two women will be forced to work the farm by themselves and none is too pleased about it. I felt that Oleanna was a book about restlessness. About wanting to leave, to get to know new horizons but also about wanting to stay where your roots are. Sometimes you have to leave so that you can come back and stay. Oleanna feels betrayed because her brother wants to leave but she also feels that she would like to know other places. To her restlessness and anxiety also contributes the fact that she still isn't at peace with how her mother died and that she is developing some feelings for her neighbor Anders Samuelsson. I did like Oleanna. Her sense of duty kept her going even when she didn't feel like it. I could understand her occasional exasperation with her sister and her sense of betrayal when she felt that Anders was leaving her too. She and Elizabeth cope with their losses in different ways and it was nice to feel that they had both grown up during the course of the story. I never quite understood Elizabeth’s relationship with Torjus father though, or how they had ended up how they were when the book starts. I enjoyed the glimpse we had of life in an isolated fiord's farm in the beginning of the 1900s, of the political circumstances of the separation of Norway and Sweden and had some fun with Oleanna's introduction to women's rights. I liked the sense of isolation they had on the farm and how that may lead them to feel isolated has individuals. I closed this story with a satisfied sigh and I wish I could read a bit more about Oleanna and know a bit more about her life after she and Elizabeth had found their happiness. I really enjoyed Julie K. Rose's writing style and how she made characters and landscape come alive. This sounds like a book for my TBR list. I, too, love reading about places I am not that familiar with. I loved this book so much! I'm glad you did too! Glad you enjoyed this, Ana. It did sound good!